Last summer, when the cover art for Hallowed was first released, I jokingly threatened to show up at Cynthia Hand’s house with a pie and $20 in the hopes that she’d let me read the book early. I’m grateful that Cynthia tactfully overlooked my borderline stalker tendencies fangirling enough to do a two-part interview for this blog. In yesterday’s post, she went into detail about her exhaustive research for this series and talked about the question of free will versus predestination. Today we’re taking a look at the lighter side of things now that we’ve gotten those burning questions out of the way. Fun Questions with Cynthia Hand! How has your life changed since you published Unearthly? It must be pretty amazing to have readers react to your characters with such devotion. It’s been a crazy year, that’s for sure. 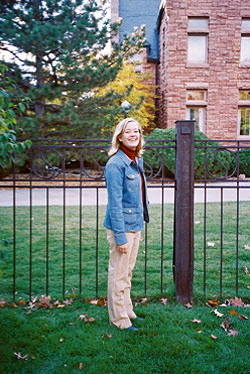 When I was writing Unearthly, I really was writing for myself, exploring that world every day, spending time with Clara. But since the book’s been out everything is so much more hectic. I have to schedule time to spend with my characters now! It’s been fantastic to read the reaction from the readers. I’ve been trying to stop reading the reviews, since it can be so distracting, but I love finding out what the reader’s favorite moments were or their favorite lines and hearing their predictions about where the series is going to go. The readers are the best part of this whole publishing thing. It is awesome to get to share my little story with so many people. What’s a typical day like for you these days? Is it hard to balance being a writer and a mom and a wife and a professor? My typical day is a circus, truthfully. I take walks with the family in the morning, cook breakfast, truck the kids off to daycare for a few hours, spend some time writing, then clean and do laundry and cook dinner and read stories and give baths and slip away to do interviews and blog and keep up with all the marketing and email flurries and fan mail. It’s exhausting, honestly. I need a housekeeper in the worst way. I took the semester off from teaching for the spring and I am so glad I did. I’ve got way too much on my plate. Which is a good problem to have, I try to remind myself. Other people would be very happy to have my problems. A lot of readers really like the outdoorsy Wyoming setting for this series. Do you ski, fish, go winter camping, etc, as Clara does? Are there other elements of Clara that can be found in you? I used to be a ballet dancer, like Clara, and a skier. Outside of that, I think the one element in here where I can really see myself is the way she thinks about her dad. My parents divorced when I was seventeen, which was pretty devastating. Clara’s family broke up a lot earlier than that, when she was three, but a lot of the things she says about her dad are straight out of my heart. There’s a passage in the early part of Unearthly where she’s talking about her dad that could almost bring me to tears when I read it. Clara has a powerful memory of her dad shaving, which is utterly mine. And in Hallowed Clara really gets to reconnect with her dad in the face of a tragedy, which is similar to what happened to me. That and I’d like to think she and I have the same kind of sense of humor. Were you prepared for the emotional response your books have received? No, I wasn’t really prepared for how heated and intense it could get. But I think that’s wonderful. Good books should grab you by the gut, so I am pleased when I see that kind of thing happen for my readers. It tells me I got something right. I think one of the most memorable things that has happened to me so far was one day while I was at Pepperdine about to teach a fiction class, a group of prospective high-school-aged students walked by on a tour, and one girl stepped out of the crowd and stopped me and said, “You’re Cynthia Hand! I love your book!” I was so stunned that she recognized me! Another time a fan drove five hours just to have me sign a book at this little writer event I was doing, and I could see in her face how important it was to her, and I was so touched that I almost started to cry. I was also nine months pregnant at the time, so I was a tad emotional in general. . . There was quite a buzz when it was announced that Unearthly had been optioned for development as a television series. What’s your biggest hope for that project? Were there any “THIS MUST HAPPEN” clauses that you insisted on? And now, for personal reading questions! Book, e-reader, or both? I have both and I love both. My Kindle is always with me, but it will never quite match the smell and feel of a book in my hands. What was your favorite book as a young adult? Oh geez, stars in the heavens. Ender’s Game, probably. Or Mercedes Lackey’s Arrows of the Queen. I was really into sci-fi and fantasy back then. Makes sense! And finally, what book are you most dying to read in 2012? The sequel to Blood Red Road. I LOVED that book. Hallowed is available for pre-order and will be out in stores on Tuesday, January 17th. If you haven’t read this beautiful sequel yet, you’re in for a treat. And if you haven’t yet read Unearthly…what on earth are you waiting for? Don’t forget that Harper Teen has Unearthly on sale as an ebook for just 99 cents right now, too! So there’s really no excuse for not finding out what everyone is raving about. Big thanks to Cynthia for her thoughtful and gracious answers. Be sure to stay up to date on everything she’s up to via her blog, GoodReads, and Twitter! Wendy, thanks for pointing me to this! And I’m going to get more substantive shortly, but first I’m taking a moment to squee over Ms. Hand and I sharing the same (naturally awesome) early reading tastes. ENDER’S GAME!!! ARROWS OF THE QUEEN!!!! (All of the Valdemar books, really, still lined up in series timeline order on the bookcase in my living room.) Heeheehee … I just had a great feeling about CH, and it is SO lovely to have it validated, even beyond the amazing stories she has gifted to us thus far! Thanks Celine! And believe me, it was my pleasure. Hope you cry as much as I did, hah. Hah, I tried to thing of a less self-important word than “epic,” but I was so excited by this that I failed. ;) Thanks so much, Sam, it should be very interesting to see how this story is adapted. Ohhh, a television series? How fun. I just ordered Hallowed. It’s going to be at my door on Tuesday! Oh, I really do hope they stick to the spirit of the book series if they make it into a TV show. It’s hard watching books be turned into TV shows/movies because I’m always comparing the two and the books usually end up winning. It kind of wrecks the fun of the movie/show a little. Yes, agreed. “Spirit” is the key word for me too, though–sometimes adaptations can be a little *too* faithful, I think. I’m cautiously looking forward to seeing this adapted into a new medium. III know! I hope they pick actors who look like the people in my head, otherwise I’m going to be snarking at the television screen every week. Do more of this, Wendy. :) Amazing review! 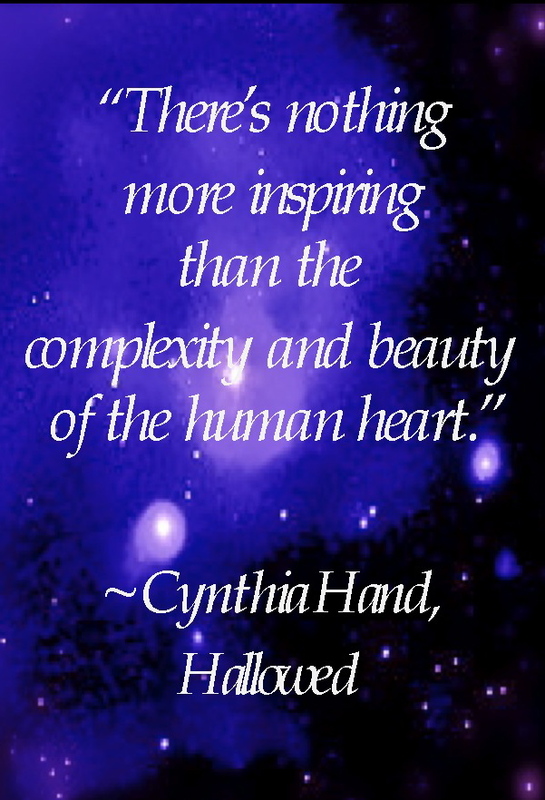 I think Cynthia Hand is a fabulous author and I can’t wait for the next book in this series. 2013 is so far away. Great interview! Both of them. I love Ender’s Game too. I would think that writing the second book is the hardest one of all. Because things change so much between writing a first book, being published, and writing a second book. Writing a third book isn’t as big a change. I agree, the second book always seems to suffer from middle child syndrome. But this one avoids all the usual pitfalls and stands very strongly on its own. Yes, the television series has a lot of potential Andrea–fingers crossed! Thanks so much, Small Review. This was an easy one since the author was so generous with her time and her insight. Ooo, I hope you enjoy BRR Elena! It’s action-packed and entertaining, the way that Divergent or Legend (by Marie Lu) are fun. Thanks Rebecca! I suspected there was some of Cynthia in Clara, since so many of the activities she was involved in seemed so grounded an authentic. I think the winter camping thing might be cool. Hope you enjoy Hallowed when you get a chance to read it, Infernal Wings! I’ve read Unearthly and I found that I enjoyed it! But I’m ashamed to say I haven’t read Hallowed yet! I’m trying to get my hands on it! Lovely interview! I hope that IF they are considering a TV series, that the producers/directors don’t ruin it! This is such a great interview! Loved hearing about all the experiences has and is going through. It’s really cool that Cynthia has done all the outdoors stuff herself. This second half was beautiful. 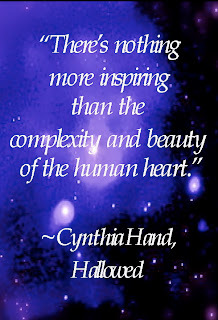 Cynthia Hand is as lovely as her books. Wendy, I second your idea of showing up in her house with cake and $20 to read the third installment. What a fun interview! I think it’s interesting she used to be a ballet dancer! That was one of my childhood dreams, haha. I really need to get to reading Blood Red Road, I read the very first page and that’s it. I’m so so excited for Hallowed. This was a really fun interview. I love hearing authors talk about their interactions with fans. I’m so shy that the idea of approaching an author and talking about their book with them is incredibly daunting. Thanks to both Wendy and Cynthia for taking the time to do this interview! I had no idea that a series is in development! That’s sure to be a hit. Thanks so much, everyone! I truly appreciate all your lovely comments and enthusiasm for this interview. :) I often delete some questions when I do one of these, but Cynthia’s were all so interesting that I didn’t leave out a single one. Jeannette, Valkatis–I’m really looking forward to Blood Red Road, too! That book was just all kinds of fun. Idaho people DO seem to be amazing, Sandy and Heidi. I hope I get to visit sometime, it looks gorgeous. Roro, I like this book trailer too. Pretty ominous stuff, and it sets up the beginning of the book very well. Missie and Bibliophile, that was my favorite part of this second part, too. The scenes CH talked about in regards to her parents were really touching in the book, and reading the backstory made me tear up a little bit, too. You can totally do it, Anonymous Reader–the end is in sight. :) And it will be worth the wait. I hope those of you who haven’t read Unearthly yet will get a chance to read it soon. There’s good reason for all the hype! Congratulations on such a stunning sequel, Cynthia! My parents divoced when I was sixteen, and like just like Cynthia shared of her own experience, it hit me hard. I still think on the little things and wish it hadn’t happened. It saddens me that my relationship with my dad is so uneasy. I bet I’ll be an emotional mess when I read Clara’s memories. I’m so excited about the show. I can’t wait to see the story come to life. I think I just teared up reading that. Mine divorced at 14, and yeah, it’s devastating. No other word for it, and now I really thing I need to pick this one up. Such fantastic questions and answers! I can only imagine how busy her days are now, I have stress just thinking about it. Definitely a good problem to have, being that busy, but I’m still exhausted on her behalf:) Unearthly and Hallowed were both books that grabbed me by the gut, so I’d say they were quite a bit more than just “good”. Thanks so much for this outstanding interview! Awesome interview. I don’t care for angel books, with the exception of Unearthly. Love this book! I still haven’t read Unearthly, though I’ve had a copy on my shelf or what seems like forever! I really enjoyed this interview. It was insightful and interesting without giving away too much for people (like me) who’ve yet to read the book(s)! Awesome! Gotta love an Idaho girl. I can’t wait to see where her career goes! Blood Red Road, YES! It was a So-Good book from last year, besides Unearthly, of course. This interview was touching and funny and informative and everything I could have wanted. I was already a big fan and now I’m an even bigger one. Thank you! I was so happy to get to read her book ‘in advanced’ and I hope that many readers will love it just as much as I did. She is such a great writer, yes she is! The second part was just as awesome as the first! I love this interview. It makes me even more eager to get my hold for Unearthly from the library, however long THAT takes. I can do this. It’s only six more days. And the second half was just as epic as the first! I’m so glad you got to interview Cynthia, Wendy…it really shows in your questions just how much you enjoyed the books.